TOUGH SHOT - Lance P�rez, associate professor of electrical engineering, (left) watches a lay-up drop through the basket as a defender from the Iowa Chariots defends in the Madonna Inviational on Feb. 10. 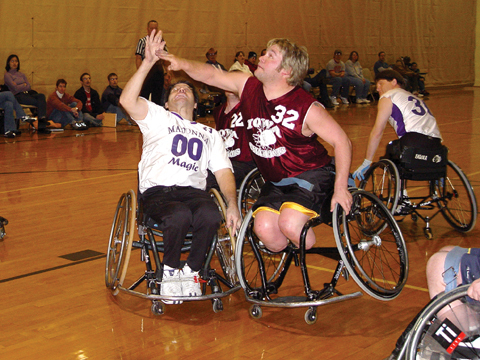 P�rez has played wheelchair basketball for years, including the last 10 with the Madonna Magic. P�rez enjoys his extra-curricular activities, which include basketball, softball and hand cycling. Photo by Troy Fedderson/University Communications. Jockeying for position in the paint, Lance Pérez reaches for and snares a rebound. A project aided by ITLE funds is providing an information jump-start for a select group of incoming freshmen. UNL wheat breeders and geneticists are part of a national scientific team that has received a $5 million grant to harness genetic technologies to improve U.S. wheat quality and disease resistance. Harvey Perlman, chancellor, issued this message concerning the UNL budget situation in a Feb. 15 campuswide e-mail. Use of Personal Response System units, or "clickers," continues to grow in UNL classrooms. A leader of the Harlem Renaissance, Aaron Douglas has been described as "the father of African-American art." A glimpse into the daring reign of Queen Elizabeth I of England is coming to Love Library. The Robert Hillestad Textiles Gallery will showcase the artwork of Joan Morris in the exhibit "Joan Morris, Master Dyer: Individual and Collaborative Work," March 6 to 31. The Sheldon Memorial Art Gallery will open "Contemporary Art: 1980 to the Present," on March 4. University Theatre, the academic year production program in the Johnny Carson School of Theatre and Film, continues its 105th season with the comedy, "The Learned Ladies." The annual undergraduate art exhibition opens Feb. 27 in the EisentragerHoward Gallery in Richards Hall.